Fixed by Code: Do you miss the days at BorCon? I had, or maybe I still have a tendency to save old stuff that have some sentimental value - my wife would probably say she had the same - still having me around. Well anyway, I have decided to digitized the most of that old stuff - things I haven't used or looked at for years - digitizing it so I would not feel a sentimental loss - lets hope my wife won't settle with a digital photograph of me - or a 3D model (that would be cool). And since it actually is a year with a couple of anniversaries - the first programming language I learned turns 40 years - and my favorite programming language and IDE get out of its teens (a well behaved and brilliant teenage it has been), I am happy I hadn't thrown everything out. So one of the things I thought about, years back, was a tribute to the old Borland database/developer conferences - years 1992-2005 - showing Borland bucks, programs and event flyers. These days we have CodeRage, Skill Sprints, DelphiWeek and a lot of other great things going on. And thankfully the teenager hasn't been spoiled by all this extra attention it have gotten over the last years. 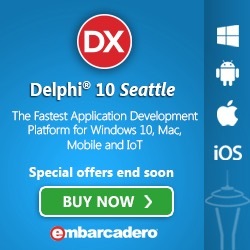 But there is also numerous physical conferences going on Delphi Developer Days, ITDevCon, Delphi Code Camp 2015 and you could also look at the Embarcadero Events page or find a meeting at your local User group - like we in Denmark have DAPUG, there is a lot of other user groups around the world.. I have only put up some one the schedules from the programs - the ones that have surfaced in my boxes - but I will probably link to the remaining scans or make a separate Nostalgia page - to not cluster up this one. Ejoy :-) also last day day of #DelphiWeek 2015.